When an animal suddenly jumps out in front of your car, your first instinct might be to swerve around it. Unfortunately, this isn’t the safest reaction. While you may or may not miss the animal, there is a significantly increased chance that you will hit another nearby vehicle. Car-to-car collisions cause far more damage than a car-to-animal collision. Breaking instead of swerving can help keep multiple cars out of the auto shop. Animals are often more active as the sun is rising and setting. These twilight moments account for the mass majority of animal collisions around the world. If you’re driving during these times, pay close attention to your surroundings. Driving a little slower on your way to dinner is the way to avoid a trip to a collision repair specialist. Many animals, like deer, often travel in groups. Remembering this can help in preventing animal collisions. 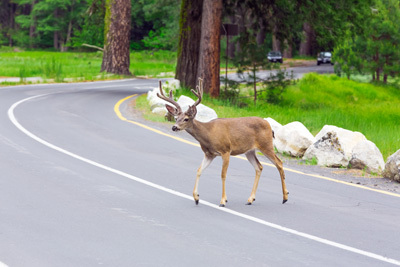 If one deer crosses the road ahead of you, decrease your speed in anticipation of a second or even third deer to follow shortly after. Being extra cautious can help you avoid the need for unwanted collision repairs. Need Car Repairs After an Animal Collision? Do you need help repairing your car after an animal collision? If you’re looking for a professional auto technician in your area, contact Renton Collision Center of Renton, Kent, Tukwila, Bellevue, Newcastle, and Maple Valley today. Visit our website for more information about the services we offer or call (425) 230–3350 to schedule an appointment.